The list of foods containing prebiotics is quite large, and there are a lot of delicious foods with a high content of prebiotic fibers, and if you plan properly your daily diet, you shouldn’t need supplements. However, prebiotics need to be carefully balanced with probiotics, otherwise they can cause a lot of discomfort, especially in the abdominal zone. 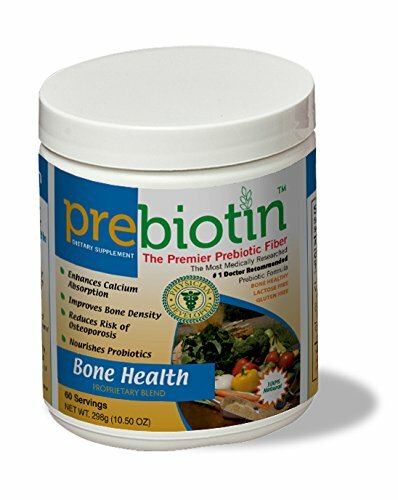 Prebiotics are in general defined as the food of our gut bacteria, (the probiotics). In order for the probiotics colony to thrive, and do its job, it needs to be healthy, and to multiply. For this, the colony needs food. The best food for your gut bacteria are some dietary fibers, that humans cannot digest, but they are the best food for probiotics. Some of the fibers that are great for feeding our bacteria colony are: inulin, fructo oligosaccharides, galacto oligosaccharides, lactulose, (a synthetic sugar), resistant starches, beta glucans, and mannan oligosaccharides, which are not accepted by the entire scientific world as prebiotics. Prebiotic foods, if you haven't figure that out yet, are foods with an important content of the dietary fibers that favor the growth of probiotic bacteria. If your gut bacteria colony is big enough, prebiotic foods are a great way to feed your colony and maintain it healthy. If you don't have enough good bacteria in your gut, or you have more bad bacteria than normal, you should eat probiotic foods, take probiotic supplements and feed the colony, so it doesn't die of starvation. A lot of foods contain prebiotic fibers, but most of them do not contain enough for a therapeutic dose, so we will help you chose the best prebiotic foods, the ones that are the easiest to find, are more popular, and are somewhat easier to tollerate, although there are very few foods with prebiotics that are easy on the stomach. Be aware, when you start to increase the prebiotic dose, you could experience serious discomfort. Later on the page, I'll show you some ways to minimize that discomfort. Garlic - anyone knows this one, it is loaded with prebiotics, but once is cooked most of the fiber transforms in sugars. Bananas - bananas don't have as much fiber as the other foods, but they are easy to digest, and very well tolerated by our digestive system. One a day should be easily tolerated by anyone, although with only 1% prebiotic fiber content, you need other food sources as well. Green, raw bananas and plantains contain another type of prebiotic: resistant starch. However, green bananas are not for everyone. Chicory Root - Raw chicory root is so rich in prebiotics, that you will only need just a little to get just enough, that is approximately two teaspoons of the powdered root. The point is to dry it without over cooking it, by roasting the chicory root, most of the inulin, the prebiotic fiber in chicory root, will transform in sugars. In fact, because inulin can cause many stomach problems, if not taken with enough probiotics, many coffee substitute manufacturers will try to rost the roots as much as possible, to reduce the inulin to minimum. Honey - no doubt, honey is probably the most pleasant of the prebiotic foods, with no side effect at all, if consumed in moderation, and with a lot of other health benefits. Honey contains some unique oligosaccharides that have an important prebiotic activity. They are not as potent as fructooligosaccharides, (read inulins), but they have many healthy enzymes, and in moderation they don't cause any upset to the stomach, as inulins. Here is a study comparing honey and FOS as prebiotics. Asparagus - raw asparagus contain 5% prebiotic content, which makes it a great prebiotic food. Although raw asparagus is not as palatable as other foods, slightly cooked to retain some of the fiber, is the best. Acacia Gum - acacia gum, or gum arabic, (do not confuse with Arabic gum, or mastic), is the the food with most content of prebiotic fiber, 86%. It is used in the food industry as a stabilizer, it is perfectly edible, and it is very nourishing. Acacia gum is definitely my favorite food, source of prebiotic fibers. Artichokes, (with Jerusalem artichoke the most rich in prebiotic fiber), cannot be eaten raw, but if they are pickled in brine they will retain most of their prebiotics, with the addition of probiotics. Leeks - raw leeks, with a content of around 12% prebiotics, just behind garlic with 17%, and ahead onions with 9%, is a great source of prebiotic dietary fiber. Just make a salad with salt, a little raw apple vinegar, olive oil, and you have a great, easy to digest salad to feed your gut colony. Onions - raw onions have a content of 8-9 % of prebiotic, while the cooked ones only 5%, which really is not bad. The more you cook the onions, the more it loses the fibre, which turns into sugars, hence the sweet taste of cooked onions. Cook it just enough to be easier to digest and you'll make both your stomach, and your gut happy. Whole Grains - whole grains have a decent content of fiber for your probiotics, with almost 5% content by weight. This makes whole grain breads a great food for your digestive health. Additionally, grains contains resistant starch as well, and beta glucans. It looks like whole grains are the most complex prebiotic. Legumes - legumes are a moderate content of prebiotic fibers - FOS, but they contain resistant starch as well, and they are rich in proteins, and are delicious. You can eat enough of them without any inconvenience. If you want to avoid the inherent flatulence, start eating less of them, or take them with probiotic supplements, or with sour pickles. The best are the white beans, because they contain the greatest amount of starch. Black beans, garbanzo beans are great too. Unpasteurized Apple Cider Vinegar - vinegar is a great source of fibers if it's raw. Do not buy pasteurized and filtered, raw is the best. I make my own, but Bragg Apple Cider Vinegar is pretty good too. Apple cider vinegar is a great prebiotic, not only because of its high content in pectin, (a great prebiotic), but because vinegar helps convert resistant starch into butyric acid, a great support for the intestinal microflora. Dandelion Greens - thy are delicious as a salad, and very enjoyable raw. They provide enough dietary fiber to support the health of the good bacteria. In fact most of the greens are a decent source of dietary fiber, so if you eat kale, spinach, or collard greens, you are on the right path. And they are less bloating than other foods on this list. Most Coffee Substitutes - coffee substitutes contain roasted chicory root, (rich in inulin), and some contain dandelion root. Cooked and cooled potatoes contain resistant starch, one of the best prebiotics that there is. Baked potatoes are great too. The best are raw potatoes but since we cant eat raw potatoes, another great way to get the raw potatoes starch is from Bob's Red Mill Potato Starch Unmodified. Start with half a tablespoon in a glass of water and work your way up to 3-4 tablespoons. Cooked and cooled rice. Sushi is a great, delicious way to get some of that resistant starch in your diet. Some mushrooms, like shiitake, maitake, and reishi, contain beta glucans, a novel prebiotic. Brewer's yeast is a prebiotic because of its high content in beta glucans. Most of us think about brewers yeast as a probiotic because of the Saccharomyces boulardii, but the high content of beta-glucan make it one of the best stimulants for our intestinal microflora. Brewers's yeast also contains mannan oligosaccharides , a pseudo prebiotic. All vegetables are best uncooked, in order to preserve intact their fiber. Cooking transforms the prebiotic fiber in simple sugars, so when you cook them, you will get a lower fiber content from the same amount of vegetables. However, you cannot eat too much raw onions, or too much raw garlic. It will make you sick. Even something as coffee substitute, that might seem completely safe, consumed in large quantities will give you intestinal cramps. This is only valid for soluble fiber though, most indigestible sugars will transform in simple during cooking. For instance, agave nectar, a fructose based sweetener, is industrially obtained this way. On the other hand, some resistant starches are obtained by cooking and cooling the respective foods. Some othere types of resistant starches maintain their prebiotic effect in raw state. Prebiotics are not for everyone, for some people prebiotics are just not the right thing. According to newer theories, fiber can be detrimental for people with an unbalanced micro-flora. Many food fiber sources feed our gut bacteria without discrimination, so all bacteria, good or bad, gets fed, and multiplies the same. For someone with an infection this can be more harmful than healthy. So the safe approach is to stick with fiber that is prebiotic. If your fiber sources make you sick, IBS, GERD, etc... stop eating that type of fiber, or lower the dose to a dose that doesn't make you sick. The best prebiotic fiber in my experience is acacia fiber. I started using it a while back, and people who take it have only great words about it, and then I discovered the scientific support for what I already discovered myself. Here is the link. Going back to fiber and acid reflux, too much fiber can cause the fermented fiber to spill into the small intestine. This will cause the bacteria to grow where is not its place, in the small intestine, a condition named SIBO. The key is to feed your microbiome a varied menu, not only fiber. In fact, even with a well balanced prebiotic diet, containing all types hard-to-digest-cabohydrates, if you eat too much of them it will get you sick. The key is to eat it in moderation. When you start to detect side effects, reduce the amount. You can find more on this from Norm Robillard. Starting with small prebiotic quantities, will selectively feed the good guys, helping them grow a strong colony. If you take more prebiotic than your good bacteria can eat, you will end up by feeding the bad guys. Hello, thank you for this comprehensive article. I have a question about one of the scientific references you have provided: Under the heading 'The Dangers of Prebiotic Fiber' you mention the benefits of acacia fiber but then the link to scientific support leads to an article about psyllium husk fiber. Is acacia fiber and psyllium husk fiber the same thing? Paulina, I have fixed the link. Good catch, my apologies for the confusion created. Psyllium husk is a gel forming fiber, while acacia gum is a dietary fiber. They are both great, and we should take them both on a regular basis. brewers yeast needs to be active and fresh or it is ok to be inactive and dried? also yeast contains MOS. Joel, brewers yeast needs to be inactive. Eating active brewer's yeast can cause you serious gastrointestinal distress. Excellent web site. I have heard that partially hydrogenated guar gum, PHGG, has similar if not better efficacy to acacia gum? pectin for homemade jams - as prebiotic? Phil, Any fiber you start taking, caries a serious risk. If you take too much you risk serious gi distress, including pain and acid reflux. The point, if I wasn't clear, is to have a balanced diet, containing a variety of fibers, not just one. Once again, start slowly with any fiber, and work your way up. If in doubt, look for qualified medical advice.